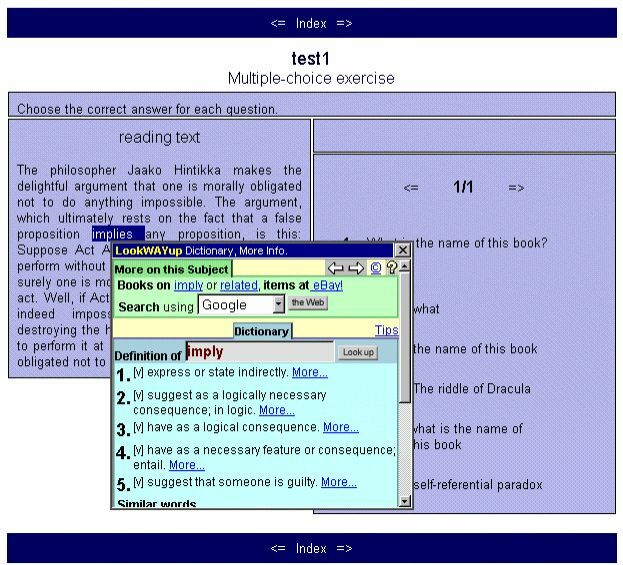 The Hot Potatoes suite is a set of Computer- Assisted Language Learning tools that lets teachers easily create interactive web-based exercises. 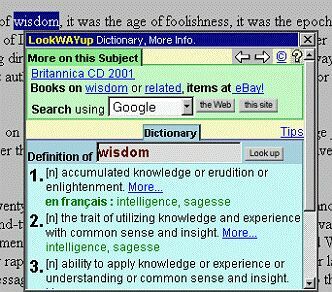 LookWAYup is an online 175,000 term point-and-click dictionary/thesaurus for web pages. Both are free to many educational users. Now both can be combined in a matter of seconds, using techniques that are not entirely obvious. The Hot Potatoes suite was created by the Research and Development team at the University of Victoria Humanities Computing and Media Centre, and is marketed by Half-Baked Software. Hot Potatoes is not freeware, but it is free of charge for non-profit educational users who make their pages available on the web. The Hot Potatoes suite includes six applications, enabling you to create interactive multiple-choice, short-answer, jumbled-sentence, crossword, matching/ordering and gap-fill exercises and make them available on a web page. LookWAYup is an online dictionary/thesaurus with optional translation that can be integrated into a web page, and lets students double-click on any word to get definitions, related words, translations, all without leaving the web page. It is also not freeware, but currently the fees for the English-only version are waived for small non-profit volunteer organizations, and for a single school of up to 1,000 students. Registration is required if more than 25 students have access. The two products together are a powerful combination for teaching language skills. On every page where you enable it, your students can double-click a word on the page and get dictionary definitions, synonyms, related terms, and even a translation of each sense of the word into their language. Hot Potatoes gives you the choice between "version 5" and "version 6" varieties of the exercises you create. As a general rule, version 6 is more tolerant of tools like LookWAYup. Version 5 uses frames, or small web pages within a larger web page, while version 6 usually does not. While frames can be efficient, there are more things that can go wrong. However, even when you want to use Version 5, there is a simple way to make it work. This page is enabled with LookWAYup, so it is possible to double-click any word on the page to pop up a small dictionary window. Create the output (Version 5 output vs. Version 6). Most of the Hot Potatoes programs give you the option of associating a reading text with the exercise. You can make the text appear and disappear with a timer. To add reading text to an exercise, select "Add Reading Text" on the "File" menu. The text can be cut and pasted into a window or included in a separate file. These options will apply to all of the screens in the quiz and you can save these options so that LookWAYup is included on all your exercises from now on. To publish the exercise, select Version 6 output. Now LookWAYup can be used on any word on the page, be it reading, instructions, or questions. The instructions above will not work if you are using Version 5 output. Version 5 output uses frames. This can be very useful if you want the dictionary to be available only for the reading text but not for the rest of the web page, and then again only when the reading is visible. However, you need to edit the template files to allow it. This is easier to do if you have the registered version, but I will only describe the more difficult procedure using the unregistered version. If you are worried that you might damage your version of Hot Potatoes permanently, Hot Potatoes helpfully comes with a complete backup of the original templates in another directory, so any damage can be undone. I am describing the process using Windows, but it should also work on Mac. 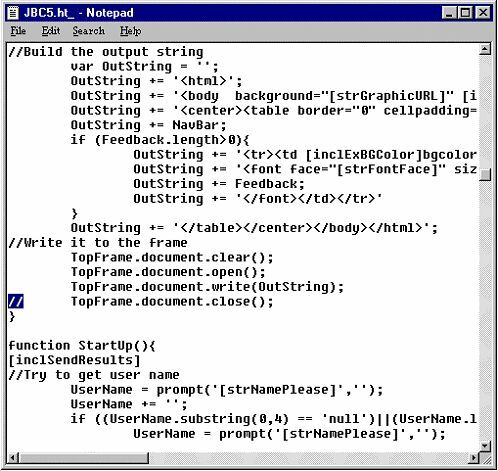 Open a text editor such as Notepad. If you don't know how to do this, then maybe you should consider asking someone else to edit the template files for you. Open the file named "JBC5.ht_", usually in the directory "C:\Program Files\HotPotatoes\source". Using the Search menu item, find the string "close()". Comment out this line by inserting "//" at the start of the line. This occurs in several places in this file, for the TopFrame, BottomFrame, ReadingFrame, and so on. The one that really matters is the Reading Frame, but it can't hurt to do them all. If you're using Version 5 output, it is possible to also make the dictionary available for the questions, instructions, and so forth but this is not recommended since these frames are too small to properly display the small dictionary box. Now save the file, overwriting the original version. Once the template is modified, you can include the LookWAYup code inside the Reading text. Note, with version 5 output, do not put the LookWAYup code in the quiz intructions as was done with version 6. The same methods work for most of the other exercise types. For Crossword puzzles, there is an interesting way to get ideas for words to use. The LookWAYup kids site includes a "Word of the second" feature that concentrates on simpler more common terms than what is found in the regular LookWAYup software, complete with definitions. LookWAYup has a number of features that benefit the learner of English at several levels. Because it finds words in their natural habitat, it reduces them automatically to their dictionary form, through its extensive understanding of grammar. For instance, when clicking on the word "kidding" LookWAYup shows the verb "kid", while "kids" shows both the noun and verb form or "kid". It is not easily fooled; "criteria" is changed to "criterion" and "aren't" to "be". Beyond correct inflected spellings, it also tolerates misspellings in words entered by the learner, particularly phonetic misspellings. For instance "emfasis" is changed to "emphasis" but the learner is told that this was an error. When it is not clear what the spelling error was, LookWAYup provides several alternatives of candidate words. On most browsers, LookWAYup also lets the learner get a definition of any word in a definition by double-clicking it. Any word on the page can be looked up and there is no hypertext indicator (colour, underline, etc) inserted in the text. Where a word has several senses, and restricted-vocabulary words often do, the most likely sense is presented first, followed by all other meanings in decreasing order of likelihood. Clicking on "More..." moves to a more detailed page with examples of usage and a thesaurus. For instance, following the "More..." button on the verb "ridicule" meaning "subject to laughter or ridicule", one finds the example sentence "The satirists ridiculed the plans for a new opera house." The student learns that synonyms include "laugh at" "make fun" and "poke fun", that to ridicule is to "mock", and that more specific verbs include "satirize" "debunk", and "stultify". Clicking on "mock" similarly tells you that to mock is to treat with contempt, and that one can mock by ridiculing, teasing, or deriding. Licensed users of the full version would further find out that to mock in french is "moquer" and that to ridicule is "ridiculiser", "railler", or "bafouer". They would also find out that while persons ridicule persons, things or activities, it is not unusual for things to mock persons. LookWAYup, like paper dictionaries but unlike online dictionaries, moves quickly from the lexical to the semantic level: a word may have several meanings and the reader is empowered to select the correct one if this assists in understanding a text. This helps enhance both communicative and integrative language learning tasks. The pedagogical advantages of this combination of tools are clear. 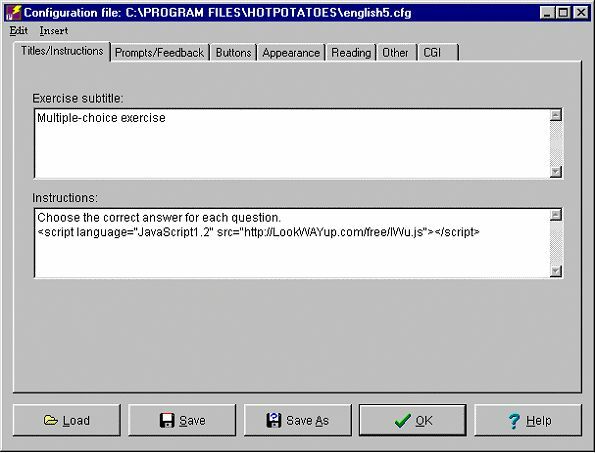 Adding a lexical resource to a Hot Potatoes computer-based exercise motivates the student to learn, to try, to make mistakes, to explore and try again. Unlike a paper exercise where any one word can be the stumbling block to understanding, this type of exercise provides the tools to overcome the difficulty, without embarassment to the learner. The interactivity of the exercises motivates leaners to act indepently and provides them a feeling of control. The dictionary means that the teacher is not forced to analyze each word to see whether each learner is familiar with the use of this word in this context. The ability to use a slightly more advanced vocabulary without risk reinforces this vocabulary for those who have seen it and allows others to rapidly acquire the vocabulary, giving them the confidence to take on more challenging texts. The value of this risk-free uncertainty certainly depends on the cultural and personal importance of embarassment for the learner. The active acquisition of vocabulary - by selecting a word and clicking on it - engages the student and reinforces the learning process more than does a passive glossary. Further, by presenting several senses the process of selecting the correct one introduces the cognitive process of disambiguation that the reader having a larger vocabulary needs to acquire. Out of all the possible meanings, using information to be reinforced in later years that one sense is common while another is less frequent, the learner must pick the correct one, therefore moving from a lexical to a semantic understanding of the term within the text. Using LookWAYup as part of a Hot Potatoes exercise means that the set of possible interactions between the learner and the learning materials is not resricted to what was predicted or prescribed by the teacher. This shifts power to the learner. Rather than exercises being perceived as puzzles to be solved with limited information, they become tasks with unlimited information.